With a little help form Elon Musk and Tesla, Jared Ewy’s video explodes. If you’ve never met Name.com’s Jared Ewy before, hopefully you’ve at least seen some of the funny videos he has created for the company. He just created his most viral video ever and it has nothing to do with domain names and Name.com. With a little help of a retweet by Tesla and a like by Elon Musk, Ewy’s video of him surprising his family with a new Tesla Model 3 has been viewed over 650,000 times. The tweet itself has 16,000 likes. It’s a fun video. And I really hope the car purchase wasn’t a complete surprise to Jared’s wife, ’cause that crosses a line I wouldn’t dare touch. GigaFactory.com and Everex.com among the more notable sales on NameJet last month. How long does it take to recover from a shill bidding scandal? About one month. NameJet reported 94 sales in September of $2,000 or greater, totaling $744,000. This is a nice rebound from August when sales totaled only $333,000. 365.tv $60,000 – This ranks as the 8th highest .tv sale ever in NameBio’s database. Everex.com $50,205 – This explains the high price. DigitalPhotography.com $17,100 – At what point is digital photography just photography? Dotcoms.com $8,108 – Now here’s a domain name that readers can appreciate it. What a brand for selling domains (or for Verisign). FootballFan.com $4,800 – You know who is not a football fan these days? One famous domain investor’s twitter feed is all about hating the NFL lately. GigaFactory.com $4,300 – Andrew Rosener’s MediaOptions bought the domain. He already has a relationship with Elon Musk with the X.com deal, so I imagine he’s pitching this for Tesla. Travesty.com $3,957 – Even names with negative connotations can sell for big bucks sometimes. PCIcompliance.com $3,875 – A big name for the credit card industry. Consultations.com $3,356 – Rather generic but it could be good for a dial-an-expert service. Demolished.com $3,125 – First thing that comes to mind is a home demolition company. Domain names registered as Tesla and UAW getting ready for fight in a California. A number of domain names were registered yesterday for an upcoming battle between automaker Tesla and United Auto Workers Union. The whois records for the domains use MarkMonitor’s domain name privacy service. Tesla uses MarkMonitor for its domain name registrations and UAW.org is at GoDaddy, so my bet is that Tesla is behind these registrations. Some of them are clearly designed to prevent UAW from using the domain names. I’m somewhat surprised UAW didn’t already own UAWsucks.com. Add a fight against UAW to Tesla’s long list of challenges in the coming year as it tries to get the lower-priced Model 3 car out the door. Company’s TeslaMotors.com web address now forwards to Tesla.com. In February, Domain Name Wire broke the news that car maker Tesla (NASDAQ:TSLA) had finally acquired the domain name Tesla.com. Its main website has long been TeslaMotors.com, a domain name it had to settle on because Tesla.com was registered way back in 1992. After acquiring the Tesla.com domain name earlier this year, it forwarded it to TeslaMotors.com. Now it’s the other way around: Tesla.com recently became the company’s official web address. 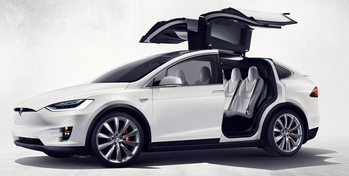 The move comes at Tesla moves beyond just selling cars. In addition to its Powerwall home battery system, the company has proposed an acquisition of solar power company SolarCity. Can Efty help domain name investors make more money? Co-founder Doron Vermaat explains how Efty creates a dashboard for your domain business, and how it can help you sell more domain names. Also: Berkens’ big payday, Tesla gets Tesla.com, big .org contract out for bid, Rightside’s biz and .Cloud shoots up into the clouds.